Choosing a college is a milestone in the life of any student pursuing a higher education. Many search for schools with the best program relevant to their field of study, while others decide on a college with an array of organizations and activities. However, there is one factor that some students may overlook: campus layout and setting. In fact, many college graduates rate their college experience higher if they were satisfied with the campus setting. Think about it; this is where you will spend at least the next four years, studying in the library, participating in activities, meeting for group projects, tutoring, etc. If you’re not satisfied with the layout and design of your campus, chances are greater that your college experience will not be as pleasant as you hoped it would be when you were an ambitious freshman. With that in mind, we’ve compiled a list of some of the most unique and most beautiful college campuses throughout the United States. Some may even surprise you. Indiana University, commonly referred to as IU is known for its jaw-dropping beauty. From the bed of limestone it sits on to the “Jordan River” that flows through the center of campus. Many buildings are carved out of local Indiana limestone and lie among fields of greenery and historic buildings dating back to the 19th century. The IU musical arts center is frequently compared to the New York Metropolitan Opera and houses over 1,000 performances each year. The Mount Holyoke College is consistently rated one of the most beautiful college campuses around, and there is good reason why. This 800-acre campus includes a botanic garden, horse stables and riding trails, multiple waterfalls, two lakes, and tennis courts. 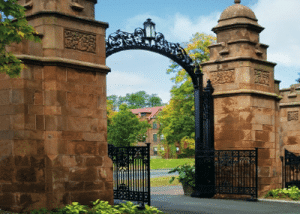 The mount Holyoke College campus is focused on “going green” and is said to even be the initiator for other larger senior colleges to take the green initiative too. Five of their on-campus buildings are LEED certified, which means that they have qualified for points in the following green categories; sustainable sites, water efficiency, energy and atmosphere, materials and resources, and indoor environmental quality. Bryn Mawr College is 135-acres of gorgeous stone buildings; these buildings were some of the first built using an architectural style that became known as collegiate gothic. Since the construction of Bryn Mawr College in 1885, the campus has served as a template for numerous other colleges and buildings plans. On top of the picturesque buildings are large open grassy areas, and even a campus pond. Twenty-one of Sweet Briar College’s thirty buildings have been listed on the U.S. National Register of Historic Places. After taking a walk around the 3,250-acre campus it is not surprising as to why, many of the buildings were designed by Ralph Adams Cram who has an eye for making things coherent and symmetrical. The campus also includes a 130-acre equestrian center where students can ride horses around the scenic backdrop of the Blue Ridge mountains. This campus is only a few minutes walk from beaches, the boardwalk, and downtown Santa Cruz, so it is no wonder why it is considered one of the most beautiful college campuses in the United States. The campus itself is covered in redwood trees and has gorgeous views of the beach and the ocean. A large portion of the campus consists of an open grassy meadow area known as “The Great Meadow.” Creeks and footbridges spot the University of California, Santa Cruz campus making it a picturesque walk from class to class. Discover paths that wind through meadows, wooded hillsides, a private pond, a botanical garden, and even an arboretum all on one campus! This is exactly what you’ll see as you walk through the Wellesley College in Massachusetts. The historical buildings plotted throughout the 500-acre campus were built to be more one with nature; there are not many courtyards or excess architecture on the campus, there are instead a lot of open spaces and nature. Many of the buildings on the University of Colorado-Boulder campus were built by architect Charles Klauder. The unique and somewhat rustic style used has been referred to as Tuscan Vernacular Revival. The buildings were built with local sandstone, limestone embellishments and red roof tiles. Apart from the buildings, the campus is gorgeous with nearby snow-capped mountains, streams, and forests. It is a great location for anyone that enjoys the outdoors. Gothic style, while a few were created after the Georgian style. Duke is also home to the Duke Forest; a 700-acre scape of trees actively used for scientific research. In 1865 the University was burnt down, now only 4 of the original buildings remain standing. Of these four, is the iconic President’s Mansion, it was built using locally made brick, and embraces the Greek Revival-style; it is even complete with Ionic columns. Another notable building at University of Alabama is the Shelby Hall, built with a more classic style and home to many resource centers, research teams, and the chemistry department. This 15,000-acre campus has some amazing views of the Hudson River and Highland Falls. The United States Military Academy is where some of the finest and bravest servicemen are educated in large grey and black granite buildings. The campus includes a cemetery where some of the most notable members of our country’s military have been buried. Cornell University campus is located in Ithaca, New York. It has 6 buildings that are on the National Register of Historic Places; two of which (Fall Creek Gorge and Cascadilla Gorge) are homes to gorges that provide access to areas of swimming and hiking. The campus itself overlooks the Cayuga Lake and has a 2,800-acre botanical garden. This campus is located on the edge of Lake Michigan, offering a number of buildings an extraordinary view just outside their windows. The majority of the buildings on campus were built with a late 1800’s architectural style, and the entrance to the campus is a large arch that welcomes students and visitors to Northwestern University Campus. Amherst College is located in New York where the temperatures and weather vary quite a bit from summer to winter. During the winter months at Amherst there are snow-capped mountains close by that set the scene for winter days; they also provide a quick get-away for students to go skiing and snowboarding a few months of the year. The campus itself however is quite large, an approximate 1,000-acres large; 500 of these acres have been made into a bird sanctuary filled with trees and walkways. Students can take homework and books to read next to the trees, or simply walk through and enjoy nature. Yale is typically known simply for its prestige as an Ivy League school, but for the last few years it has also made the list as one of the most beautiful college campuses in America. Much of the architecture is based off the Collegiate Gothic style, including the 216-foot tall Harkness Tower, and the 15-story Cathedral-styled library that holds intricate details both inside and out. Among the hills of this 164-acre college campus are 6,000+ trees that bring shade, color, and life to the Princeton University campus. The campus itself is a registered arboretum, thus the abundance of leafy life. Atop the campuses gorgeous abundance in trees are a few buildings of eye-pleasing notability. The Fenwick Hall is the centerpiece of the campus with its Eclectic style. Then there are the Corinthian columns of the St. Joseph Memorial Chapel with its Renaissance Revival style, bringing this college campus to a full in both architectural and natural beauty. This Washington campus has stunning views in all directions; from Mount Rainier to the Cascade Range, to the Olympic Mountains. The University boasts a very natural setting, including that of a cherry tree lined quad in the center of campus. The Suzzallo library is one to note, with its grand open spaces and high ceilings, all of which having been carefully designed in the Collegiate Gothic style. Of other note is the glass-face Paccar Hall with its Modern architectural style and open windows for maximum sunlight and view of the mountains. The University of Virginia is most well-known for the Palladian-style Rotunda, a building constructed after the design of the Roman Pantheon. This similarly unique Jefferson architecture is used throughout the campus; this and the rolling landscapes draw thousands of visitors to the campus each year. One of the most prominent features of the University of Notre Dame campus is the statue of Virgin Mary blessing the Grotto. She is replicated after the original found in Lourde, France. One of the other prominent and inspiring features on this campus is the gold dome that sits on top of the main building. This dome in fact, became the inspiration for the football team’s golden helmets. Aside from such large campus features are the lush green quads that give students a place to enjoy the scenery as they walk through campus. The University of Chicago has some of the most amazing architecture you’ll find on a college campus. 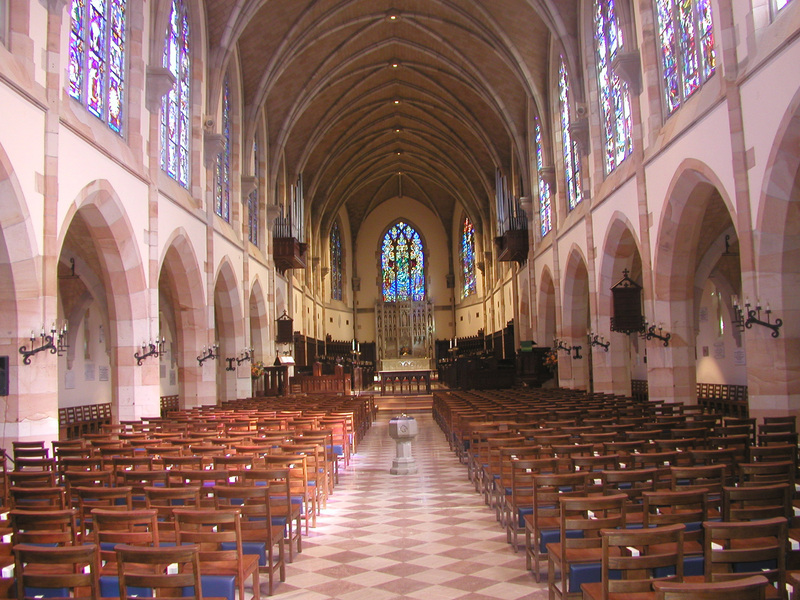 The Rockefeller Chapel is one of the most notable buildings on campus, and was donated by the Rockefeller family themselves. Many of the buildings were built using a Collegiate Gothic style, and have made their way to the National Register of Historic Places. The quad at University of Chicago is loved by its students; there are many spring flowers and honey-locust trees that help bring nature into this urban city. There is also a private pond on campus home to turtles, dragonflies, and ducks. The “harvard yard” is a large green grassy area with oak and maple trees. It is the oldest part of Harvard, and home to a few of the student dormitories. This beautiful spot is even better in the fall as the foliage of the trees begin to change color and fall to the green grass below. There are a number of beautiful buildings all across Harvard University’s campus; the High Victorian Gothic Memorial Hall, completed in 1877, and later designated a U.S. National Historic Landmark, being one of the most fantastic. One of the most amazing features of Emory University is the 100-acre plot in the middle of campus dedicated to “preserving the south.” There are water features, hiking, and walking trails throughout. The Lullwater House is a large building on campus, in the middle of the afore-mentioned preserve; it combines both the Tudor and Gothic Revival architectural elements to create a magnificent mansion. This campus just can’t help but have warm and comfort southern charm; the buildings almost all take on a classic Goth-style architecture making them aesthetically pleasing through uniformity, awe, and intimidation all at the same time. Most notable of these buildings however, is the All Saints’ Chapel, modeled after the University Church in Oxford, England, and Notre-Dame Cathedral in Paris, France. All of these buildings are then set on a 13,000-acre plot overlooking the Tennessee valley. A number of the buildings on Kenyon College campus have been inspiration to designers around the world. This includes the Ascension Hall, an extraordinary Victorian Gothic piece of architecture that is home to five academic departments: Classics, Economics, Modern Languages and Literatures, Philosophy, and Religious Studies. Old Kenyon Hall, built in 1827, is believed to be the oldest Gothic Revival building in America. Utah State University is home to one of the oldest academic structures still in use in Utah. Old Main building was built in 1890 and continues to welcome students through its doors every day. The campus itself is in Northern Utah, amongst the snow-capped mountains. The campus offers amazing views of Mount Logan, and the Bear River Range. Logan canyon offers students places to go hiking, skiing, and even enjoy summer water sports.